I thought it was about time for another review, one that could in truth be called a long term test as I have had the vehicle for a number of years. When Short Course Trucks came onto the scene I loved the way that they looked, but I had other RC cars at the time, in fact I had 5 different vehicles before I got a Short Course truck, and as they were all from HPI / HB, it was only natural to get a Blitz, and with some cash in hand I lashed out and got the racing version, the Blitz ESE so named after it’s designer (Erik Shauver Edition). At the time I also owned a E-firestorm, the platform that the Blitz was based on, so it made sense to get something with a level of parts commonality. This was my first true Kit as well, with my previous vehicles, in order, being a new MT2, 2nd hand E-Savage, a new RTR E-Firestorm, a 2nd hand D8 which I never got around to converting to an electric vehicle, and a very 2nd hand Sprint 2. A little while after I got my E-Firestorm I became involved with a local club starting up, so I raced the E-Firestorm and Sprint 2 there, however the ESE was to be my racing mainstay as SCT was the most popular class at my local. So in October 2010 I started building my new kit. Optional Items: For the most part my Blitz stayed fairly stock standard, but one optional part it benefited from was a STRC alloy steering rack. Building the kit was a new experience for me, sure I had repaired breakages and maintained the cars that I had, but never guilt one from scratch. The excellent HPI manual made it very easy for me and I had no problems at all, even with the ball differential which was something new to me. Plenty of space for electronics to be installed and no fit or finish problems of any kind I am please to report. Initially the car was fitted with the stock ESE body which was a little thinner than the standard blitz one, in the name of saving weight. I actually found that this body lasted some years, even under the duress of my terrible driving. I think that the thinner lexan allowed the body to flex more and crack less, even on the concrete and bitumen surface I was racing on indoors. Tyres of choice for the track I was on was the HPI Trepador, and so that is what I fitted to some HPI rims painted metallic green. As I mentioned before, I was impressed with the kit on the whole. Driving the Short course truck was fun, it had realistic body roll and happily hung the tail out when pushed too fast. Racing was close with other drivers side by side and competitors of all experience in good supply. I had some trouble at the time with understeer, but after consulting with local guru Scott Guyatt it turned out that my driving (too fast into the corner) was more to blame than any setup issue. All in all it was well behaved without any quirks and did everything I asked of it, and then some! Jumps are often the folly of the short course truck were handled with aplomb, with about 1/2 throttle applied while in the air a flat landing was easy to achieve. Our track had little in the way of bumpy sections depending on the configuration at the time, however the bumps were handled well. Now don’t for a second think that this truck was pampered and only ever driven on an indoor track, it was also used whenever I had a chance for bashing at wherever I found. The Trepador tyres handled most conditions well, but as the surface became very loose and dusty, or on long grass, wheel spin and spins became more commonplace. The suspension however soaked up the lumps and bumps thrown at it very well, even those that really were much too large for it to handle. A major change in the surface that I drive on came in late 2012 when the venue my club raced at went broke prompting a 6 month search for a new venue. Once that was found, the concrete surface was a polished one which was unsuitable for driving on unless you wanted ice dancing, so more carpet and artifical turf was acquired until the track was composed of 100% Turf and Carpet. This in turn created a whole new world of grip significantly increasing grip with the right type of tyres. I found my Trepadors too slippery and moved to the Kyosho Ultima tyres. You see we have a tyre list at Launceston RC to keep racing close, and costs down. However as time went on, Carpet tyres from Schumacher and Proline were added by the committee to the approved tyre list, and Schumacher Blue Mini Pin tyres from Action RC were fitted to my truck. Whilst the grip was similar to that of the kyoshos, it was far more constant, and the tyres are looking to wear much better, and evenly. This high traction surface calls for a whole different style of driving and car setup and whereas the blitz was happy on the old surface, on this surface it is really felling dated in terms of car dynamics. Newer Mid Mounted SCT’s from Losi, Team Durango and Kyosho to name a few are performing better on this surface than the older chassis. It’s not that the Blitz ESE is bad here, it is just not as suited to the conditions as other chassis, and the mid mounted engine balance makes a significant difference. The list of damage over three years of bashing and racing were surprisingly short for a vehicle with a more stiff plastic than the normal Blitz (and therefor more brittle). No matter how much air I got on jumps, or how ugly the landing, I never broke anything jumping the truck. How collisions, that was another matter! The bumpers on the Blitz ESE do well to soak up the impact with a variety of objects, but some things are just insurmountably hard. For example, a concrete slab that my brother in law crashed head on into. Result? One broken chassis just in front of the servo. This is one place that the chassis has been stretched over the firestorm chassis and appears to have resulted in a weak spot. One broken chassis isn’t really enough to come to that conclusion, a 2nd one broken in the same place however convinced me of it. On the 2nd occasion, another driver came of a jumps section and we collided at a fairly high speed head on. The break was almost precisely in the same place (I should have take a photo of the 2 broken chassis as I have them both at home!) and so I am on my 3rd chassis. Now I don’t know if HPI changed the material that the chassis were made of, but in the last 2 years I have not broken the chassis in the same place. I have not added any further bracing to that area as some alloy parts are available to do that. The only other thing I have broken has been a few steering knuckles, which is a natural part of my average driving skills! Not bad for 3 years worth of driving. With a major distributor in Australia in the form of Hobbies Australia, parts are fairly easy to find reasonably well priced. Stock however was often an issue with many stores not carrying the parts, so more often than not I purchased parts online from mainland Australia, or in the US. There is also a plethora of aftermarket parts available in a range of materials and colours. Most SCT bodies fit and the majority of 12mm hex rims fit. I did have a set of Proline Rims that I purchased which fitted, but bound on the steering hub. I wrote to proline at the time because it was stated that the rims suited the Blitz. That said, the Blitz ESE has a slightly narrower alloy hex vs the thicker plastic one on the Blitz, but the fine print on the part stated that some cutting would be needed to make the rim fit. So after taking the dremel to the fins on the back of the hub, it fitted just fine, but it certainly left a bad taste in my mouth. I’ve since moved to DE Racing Rims and have been very happy with them. Another part that I did change was the Ball Differential. The EXE came with a ball differential made by HPI. The later ESE Pro came with a MIP one, but I just could never get it right, it was either coming loose, crushing balls or not behaving as I wanted. Strangely enough the Gear differential from the Blitz could not be purchased as a complete unit, only as parts, and the E-Firestorm differential which is the same was in the same boat. On this case Ebay came to the rescue with one from a new kit being parted out, and I have never looked back! THe build complete, with some electronics to go. I prefer the cars to look used, not clean all the time. Gratuitous team photo, you can see the resemblance. 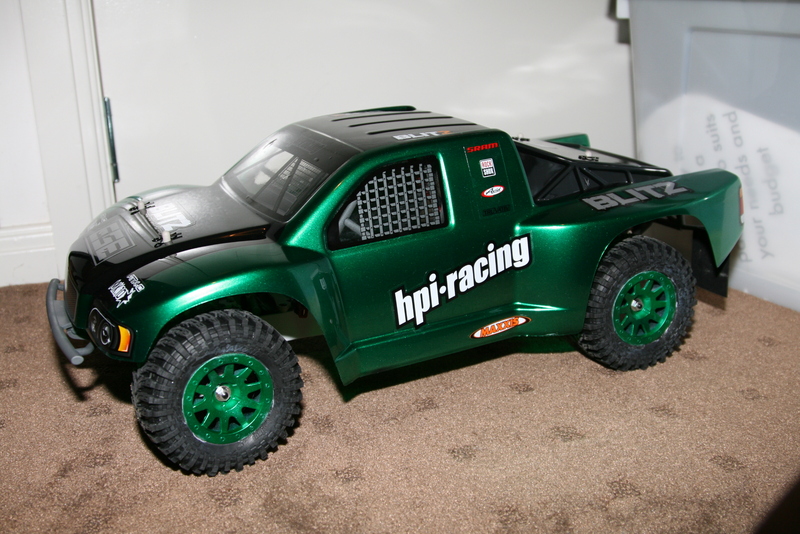 The Blitz has the Proline Raptor Flo-Tek body on here in my new colour scheme. I have loved the Blitz design from the outset, and I have had a blast with my ESE. It’s been reliable, fun and a real blast to race and play with. However it’s days in my garage are dated as it’s been used more and more for racing, a situation where it isn’t working as well for me as it could be. If I was racing on dirt or our old surface I doubt I would be looking to replace it, but as it is the old girl has the “For Sale” sign up and will be replaced with a Team Durango DESC210R when I can for parts and design commonality with my DEX210.